When one is taken in with the beauty of Venice, thoughts may not stray to thieves, peasants and the underground citizenry of the city. Yet, even a city as enchanting as Venice has its fair share of criminals. March 2014, single image, additional exposures for highlights and shadows, focal length 35mm, aperture f/11, shutter speed 30 seconds, ISO 100, 10-stop ND filter, tripod. Lord Byron, the famous poet, did think of prisoners when visiting Venice. 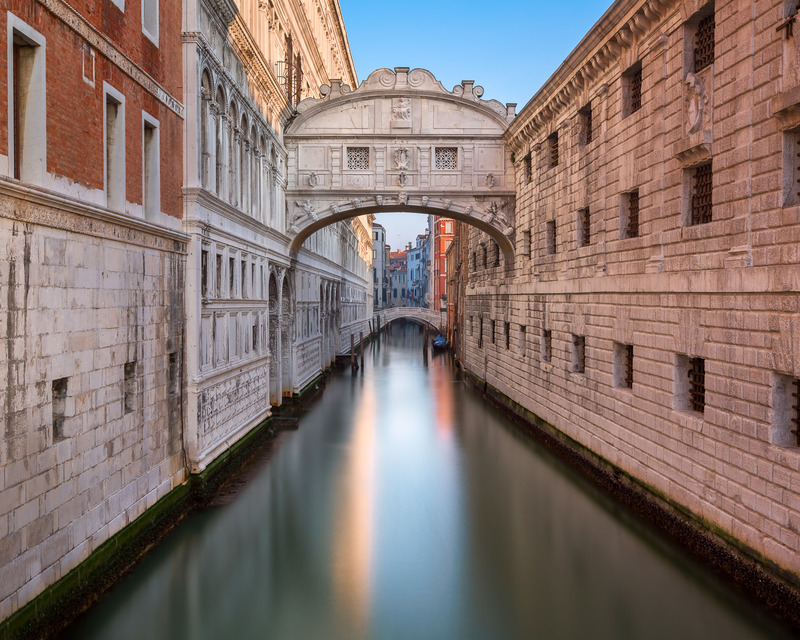 The bridge you see before you, the Bridge of Sighs, is named after a phrase in a poem by Byron. This bridge is the last place a prisoner crossed before being taken down to the tombs. The sigh is mean to represent the sigh of sadness a condemned would make when gazing out of the window of this bridge. It is a famous scene which has been photographed and painted more times than most people would ever care to count. As a photographer, it was difficult to imagine even making a unique composition here. Though this did not stop me and after completing two shoots already this morning, I headed over towards Doge’s Palace to capture this iconic image. By the time I got there the sun was already up. This dashed my hopes of a long exposure to create a smooth and ethereal feel. Yet using a neutral density filter I was still able to make the exposure longer even with the sun up. While there is no particular novelty to this photo, I still cannot imagine my Venice portfolio without it!